Do Pore Strips Actually Work? Do Pore Strips Actually Work for Blackhead Removal? Looking rather like an oddly-shaped Band-Aid, with super sticky adhesive on one side, pore strips are pressed firmly onto the skin wherever you have blackheads. The strip sets for several minutes, and then is pulled off of the skin. The idea is the adhesive will stick to the top of your blackheads and pull them out of the pore. 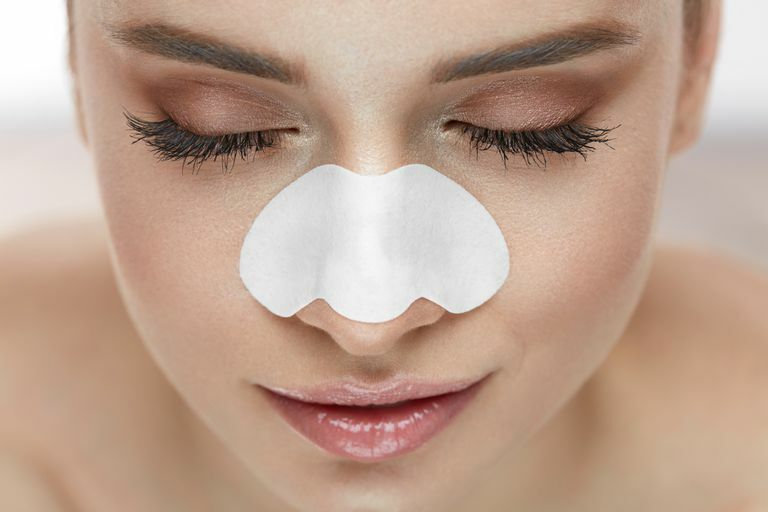 Pore strips give a quick, albeit temporary, improvement of blackheads. So in that respect, pore strips do work. But for a long term fix for blackheads, pore strips aren't the best way to go. Once you've yanked the strip off of your face, go ahead and take a look at what's been captured by the glue. You'll see a veritable forest of little blackheads sticking straight up off the strip. Your skin, too, will look less congested. It will probably also look red. The strips do pull at the skin pretty aggressively. Luckily the redness subsides fairly quickly. To get the best possible results, you have to use the pore strips exactly as directed. The instructions vary slightly from brand to brand, so make sure you read the directions on your product. Pore strips can irritate the skin, so keep that in mind. You don't want to use them too often. If you've got particularly sensitive skin, it's probably best to stay away altogether. Have you ever squeezed a blackhead? Then you know how long that plug of gunk is. Pore strips pull off the top, most visible part of the blackhead. While the tops of blackheads fill your pore strip, the rest of the blemish stays behind in the pore. Although blackheads look fairly solid, they actually have more of a toothpaste-like consistency. So the pore strips can't really grab hold entirely of something semi-solid. It's like putting a piece of duct tape across the open tube of your toothpaste and ripping it off. Sure, there will be some toothpaste on the tape, but the majority will stay firmly encompassed in the tube. So does the blackhead in your pore. Pore strips can't completely remove larger, deeper blackheads. And, unfortunately, they won't stop your blackheads from forming. And here's a cool factoid for you -- did you know not all black dots on your nose are actually blackheads? It could be follicular prominence. They look like tiny blackheads, but it's actually large or prominent pores. Pore strips won't help this at all. No matter how often you use pore strips, they're never going to get rid of your blackheads completely. For that, you will need a different treatment. If you've only got a few blackheads here and there, an occasional pore strip will probably work just fine for you. But if blackheads are a particularly stubborn problem, or you have more than just the occasional breakout, you're going to need something more powerful than a pore strip. First, try an over-the-counter acne treatment. The most effective ones will contain salicylic acid. You might even decide to make an appointment at your local salon or skin spa. An esthetician can manually clean out blackheads and pore blockages, creating an immediate improvement of the skin. Like pore strips, extractions don't keep blackheads from forming but can be a good jump-start to blackhead treatment. If you have a lot of blackheads, and you can't get improvement with OTC acne products, it's time for prescription medication. Your derm will probably prescribe a topical retinoid to help get those blackheads under control. Can You Shrink Enlarged Pores? Should Your Esthetician Squeeze Blackheads? What Are the Best Ways to Get Rid of Blackheads?